Turning left down Tremont Street, you come to another impressive church. 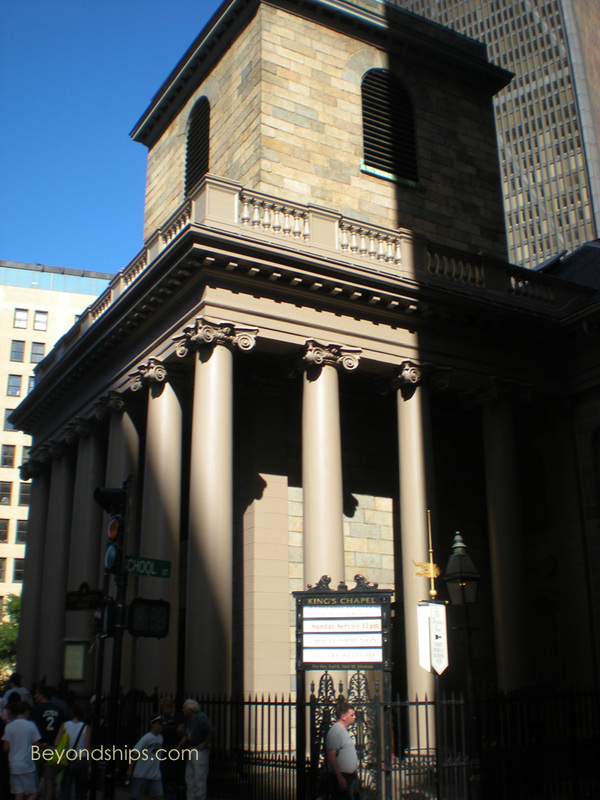 In 1686, King James II ordered that an Anglican church be built in Boston. Unable to buy suitable property, the governor erected a wooden church on a portion of the city's burial ground. That structure was replaced by the current Kings Chapel in 1749. During the American Revolution most of the congregation were Loyalists and they fled Boston. As a result, the chapel became vacant. However, after the Revolution, it reopened as a Unitarian church, which it remains to this day. The burial ground outside the chapel is the oldest in the city, founded in 1630. It is the resting place of many famous people including John Winthrop, one of the founders of Boston. Turning down School Street, you pass the Parker House Hotel, the oldest continuously operating hotel in the United States. Its patrons have included William Wadsworth Longfellow, Ralph Waldo Emerson, Sarah Bernhardt, Babe Ruth, Ted Williams, Judy Garland and other notables. Also on School Street is the Boston Latin School. Founded in 1635, it is the oldest public school in the United States. Outside is a statue of one of its former students, Benjamin Franklin. The Old City Hall is at 45 School Street, one of the first Second Empire style buildings constructed in the United States. 38 Boston mayors administered the city from this site over the course of 128 years. At the corner of School Street and Washington Street is the Old Corner Bookstore, the oldest remaining commercial building in Boston (1718). It reached its zenith, however, during America's Golden Age of Literature when it published works by Boston area writers such as Louisa May Alcott, Oliver Wendell Holmes Sr., and Nathaniel Hawthorne. Down Washington Street is the Old South Meeting House. Built as a Quaker meeting house, it was the scene of important meetings in the days leading to the American Revolution. Doubling back along Washington Street, you come to the Old State House. It dates to 1713 and was the seat of colonial government in the Massachusetts colony. The Boston Massacre took place just outside in 1770. The incident had a significant impact on public opinion throughout the colonies, pushing them towards revolution. 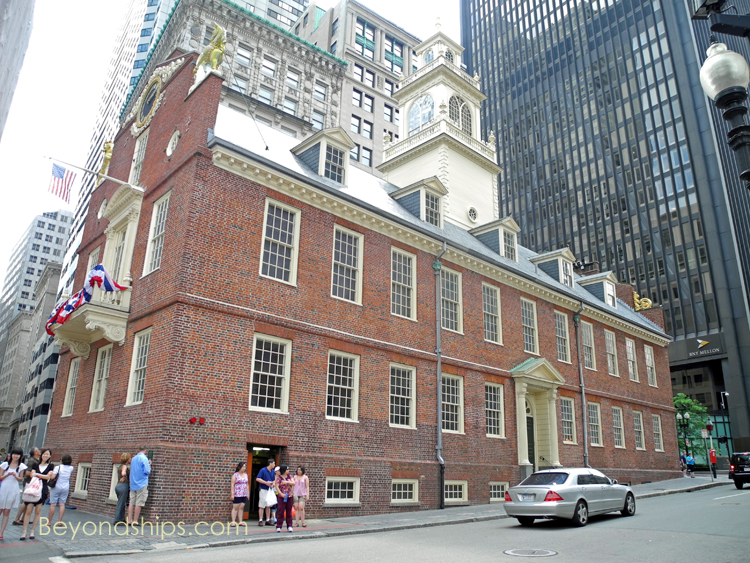 Some six years later, on July 18, 1776, the Declaration of Independence was read publicly in Massachusetts for the first time from the Old State House's balcony. 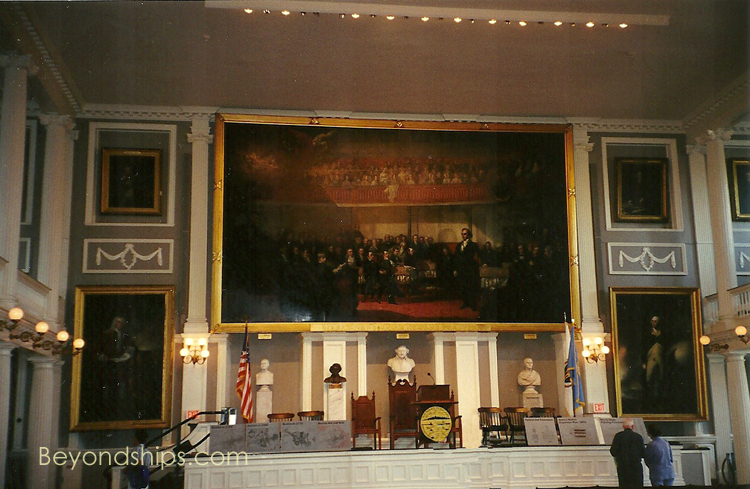 Following independence, the building served first as the seat of government of Massachusetts and then as the Boston City Hall. In 1841, it began life as a commercial building. Today, it is a museum.